For day 12 of Soup Month 2013, we have a mild, but flavorful Chicken Enchilada Soup. If you're familiar with Mexican foods, you'll know an enchilada is a popular Mexican dish, made by filling a corn tortilla with a variety of meat, cheese and vegetables, then rolling up the tortilla, and covering the rolls with a chili pepper sauce. Although a very simple concept, there are a million ways to make and serve enchiladas, and for this dish we turned this Mexican favorite into a soup. This soup is easy to make and is a great way to use up leftover cooked chicken. One ingredient you may not be familiar with is masa harina, which is a type of corn flour that's used to make tortillas. (You can also use this flour to make Crispy Shrimp Cakes with Lime Salsa.) The flour is used to give the soup its corn flavor, and it also thickens the soup to a nice creamy consistency. Masa harina flour is available at most markets in the baking section, and is very inexpensive. 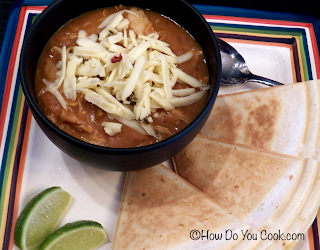 Chicken Enchilada Soup is more on the mild side, so if your kids like tacos and burritos, they will love this soup. If you like your soup a bit more spicy, just increase the dry spices a bit or, instead of 2 cans of green chilies, substitute one of the cans with a can of diced jalapeno peppers. We served the Enchilada Soup with cheese quesadillas and some cold Corona beers. In a large soup pot, heat olive oil over medium heat. Add the onion and sauté 3 minutes, then add the garlic and cook 1 minute longer. Add the chicken broth, Rotel sauce, green chilies, salt, pepper, chili powder, garlic powder, cumin and paprika to the pot and stir, and cook for 5 minutes over medium heat. Add the chicken to the soup and cook for 5 minutes, or until the chicken is heated through. Ladle into soup bowl and garnish with shredded jalapeno pepper jack cheese. Serve cheese quesadillas on the side and Enjoy!! Perfect soup for this time of year, can't wait to try! This was a yummy soup and I hope you get a chance to try it soon. Thanks for visiting and for your nice compliment.